On An Overgrown Path: Sound yoga - ancient wisdom or New Age nonsense? Sound yoga - ancient wisdom or New Age nonsense? Classical music cannot stand still; so that means it must find new audiences. Western classical music has evolved into a highly dualist art form with clearly demarcated boundaries around its core offering of the orchestral and operatic repertoire. There is little debate that this repertoire must - and will - remain central to the art form. But it can be argued that to open up new markets the current watertight boundaries around that core offering must become porous. An example of a blurring of these boundaries would be an entry into the mind, body and spirit market; a market which a post here in 2011 pointed out was then worth around $11 billion annually in the US, compared with $200 million for classical album sales. It is tempting to dismiss the mind, body and spirit market opportunity as no more than 'Mozart for meditation' and 'Gregorian Chant for the soul', but that would be a mistake. As my earlier post noted, the spiritual dimension is found in many of classical music's masterpieces, from Bach's B minor Mass to Mahler's Resurrection Symphony. And, significantly, several respected contemporary composers have proved that the border between the cerebral and the ineffable is already porous. In the programme note for his percussion composition Strange and Sacred Noise, John Luther Adams - who is one of those challenging traditional boundaries - writes of how "the strange power of noise can open a doorway to the ecstatic... beyond the usual expressive associations of "musical" sounds, noise touches and moves us in profound ways". As can be seen in the accompanying photos, I recently had the opportunity to experience the strange power of sound first hand, and this post is an account of that close encounter with the ancient tradition of sound yoga. Einstein's theory of relativity identified the equivalence of mass and energy. Sound is, like all mattter, a form of vibrating energy, and in the great wisdom traditions which predate Einstein's research by millennia, sound is viewed as a sacred energy. In Indian Vedic spirituality the Sanskrit expression nada Brahma tells how 'sound is God'. Ajahn Sumedho, a teacher in the Buddhist Thai forest tradition speaks of a resonating, vibratory background sound that he identifies as 'the sound of silence', while in his celebration of Rumi The Way of Passion, Andrew Harvey describes how a mystic in a trance can "see the atoms dancing". Quantum physics has shown how atoms are vibrating energy, and noise, sound and music are just different forms of vibrations. In an interview with me Jonathan Harvey explained that: "Energy is oscillation, largely. And when we say we are stirred by a piece of music, we’re excited, we are moved, and so on, we’re talking as if we are like a tuning fork which has been struck by some music, and it has continued to vibrate for some time". In answer to my question Can music transform matter? he replied: "We all know about the soprano shattering the wine glass. It’s all vibrations, I mean music and the world, everything is oscillation", and in Speakings - probably his most ambitious work - Jonathan used IRCAM sound processing technology to reduce speech and music to the common denominator of audible vibrations. Among the other far-sighted musicians who recognised the centrality of vibrations was the Sufi master Hazrat Inayat Khan who taught that "spirit descends into matter by the law of vibrations, and matter may also ascend toward the spirit". Hazrat Inayat Khan met Alexander Scriabin in Moscow in 1913 shortly before the Russian composer's death. Scriabin was probably the most zealous believer in what John Luther Adams describes as the strange power of noise. He was a member of the Russian mystical Symbolist movement which maintained that a work of art could have a material effect upon reality; one example of this material effect is the soprano shattering a glass. In his unfinished epic for orchestra, organ, piano and voices Mysterium, Scriabin set out to revive the lost theurgic function of ancient mystery plays. His involvement with Theosophy had introduced Scriabin to the Vedic concept of a cosmos permeated by a divine supersensuous energy known as Akâsa, a unitary vibration that possesses spiritual properties. Scriabin believed he could have a material effect on reality by unleashing the energy of Akâsa in Mysterium using music, dancing, light, scents, and sacred architecture. In Scriabin's schema the interaction of these elements would generate a vibration so powerful that it would trigger material disintegration, ecstatic universal death, and communal rebirth on a higher plane. A more recent invocation of the destructive power of Akâsa came at the 2014 Aldeburgh Festival when Antoine Brumel's Missa Et ecce terrae motus (Earthquake Mass) was bravely given in a performance enhanced by sound artist Russell Haswell at which ear plugs were handed out. The belief of Scriabin and other visionary musicians in the centrality and power of vibrations is vindicated by scientific research. Einstein's theory of relativity explains how mass and energy are closely linked, which means that even an object at rest has energy stored in its mass; while quantum field theory has identified that the interaction of subatomic particles makes the universe a dynamic inseparable continuum. The sudden and catastrophic release of the huge amount of energy stored in dense masses such as plutonium is the mechanism of nuclear weapons - devices which deliver the trigger material disintegration and universal death that Scriabin sought to achieve with Mysterium. Naturally occurring low frequency energy, such as that unleashed by an earthquake, can also be extremely destructive. Infrasound is acoustic energy below the lower limit of human hearing, and there is evidence that these very low frequencies excite resonances in the human cognitive system. Musical sounds extend beyond human hearing into both infrasound and ultrasound (high frequencies beyond the upper limit of ear). Music is not just notes being played: it is pulses of highly complex energy the impact of which on the human body is not fully understood. Cymatic images capture this complex vibrating energy; graphics available via this link include those generated by the first octave of a piano. A post here in 2009 showed cymatic images of the music of Stockhausen and Boulez captured by Alexander Lauterwasser (who is the son of Karajan's court photographer). The theories of relativity and quantum fields were anticipated thousands of years ago by nada yoga, the ancient yoga of sound, in which musical sounds resonate with energy centres in the human body. Before dismissing this as twaddle remember that the unique and prized sound of a Stradivarius violin is the result of the violin strings exciting sympathetic resonances in energy centres in the body of the instrument, and researchers at Kobe University in Japan have recently discovered that supramolecular nanofibers dynamically align in harmony with the sound of classical music. Nada yoga uses musical sounds to either excite resonances in the body to open the doorway to the ecstatic that John Luther Adams identifies, or to quieten the resonances and produce a very deep and therapeutic relaxation. In the twentieth century the related study of radiesthesia evolved. Radiesthesia is the interaction between the vibrational fields of the human body and external objects. Unlike its distant cousin synthaesthesia, radiesthenia is still commonly dismissed as a pseudoscience; however, the phenomenum of quantum entanglement together with Gödel's Incompleteness Theorem mean this harsh judgement may need revising. It was Scriabin's intention that Mysterium should be performed in the Himalayan region of India, one of those notably 'thin places' where the barrier between the material world and the world of the spirit dissolve. Scriabin's premature death meant that he was not able to unleash the divine vibrations of Akâsa and trigger the promised material disintegration in the Himalayas. However, in a far more modest way I was recently able to experiment with radiesthenia and the strange power of noise in another 'thin place'. Sougia on the south coast of Crete is a place of primal energy due to its proximity to the fault line between the European and African tectonic plates. It was famous as a centre of the counterculture in the 1960s and 70s, and the tradition of embracing alternative thinking continues there. During a recent visit to Sougia I met up with Heidrun Kimm; she studied with Peter Hess who is a leading figure in the field of radiesthesia and its therapeutic applications. Heidrun has lived on Crete for twenty-six years and is an exponent of sound massage. As the accompanying photos show, she uses Himalayan singing bowls to quieten the resonances in the human body and produce a deep and therapeutic relaxation. These complex vibrations can be seen in this video of cymatic images produced by an antique Tibetan singing bowl. Jonathan Harvey's description of how "...when we say we are stirred by a piece of music... we’re talking as if we are like a tuning fork which has been struck by some music, and it has continued to vibrate for some time" literally resonated with my own experience. 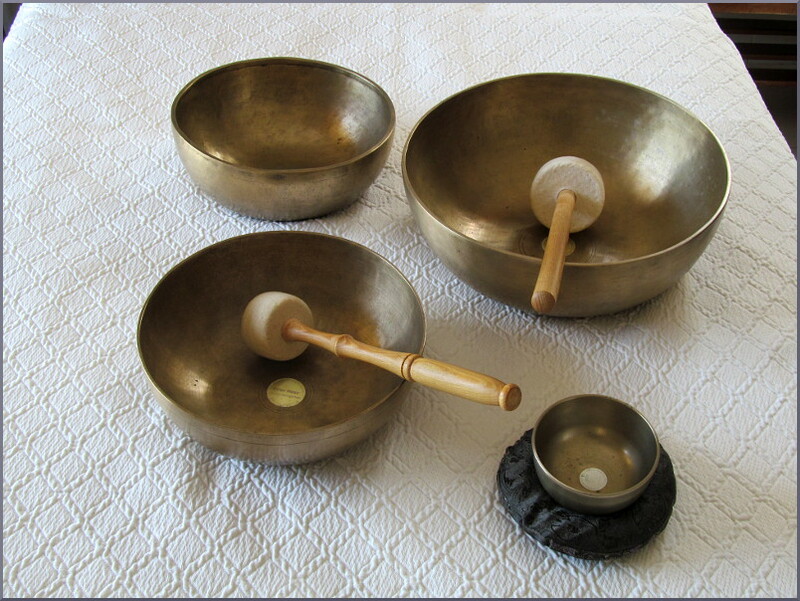 During the sound massage my body felt like a tuning fork that vibrated sympathetically with the singing bowls and it continued to vibrate long after the session finished. My own experience was too brief to be conclusive. But it did give me a tantalising glimpse of how nada yoga can provide a bridge between the world of the senses and the indescribable world of the Spirit. In his note for Strange and Sacred Noise John Luther Adams describes how his most powerful experience of the ecstatic power of noise came at the all-night drumming, chant and dance ceremonies of the Iñupiat and Yup'ik Eskimo peoples. These rituals of ecstasy and therapy, the disputed science of radiesthenia, and the strange and sacred noises of an eclectic group of composers all harness the little-understood latent energy of sound. Newton's mechanistic physics, which viewed the universe as an agglomeration of 'mass points' fixed in absolute space and time, have been superseded by relativity theory and quantum physics that bend time and space, and deconstruct mass into energy in the iconic equation E = mc2. Sound is vibrating energy that interacts with everything - sentient and inanimate - in close and distant proximity. Yet despite an obsession with change, classical music remains firmly rooted in the mechanistic world of Newtonian physics; where Britten's intimate 'holy triangle' of composer, performer and listener is blown apart by the distancing technology of music streaming, where the market is viewed as a monolithic mass and the interlinked constituents of a performance are rendered into unrelated binary digits. This binary conditioning dictates that a proposition can only be right or wrong, with no possibility of nuanced middle ground. That means, inevitably, this post will be condemned as New Age nonsense by many. Which I suggest is short-sighted: because in their very different ways Bach, Mahler, Scriabin, Jonathan Harvey, John Luther Adams, not to mention numerous communities of monks and nuns, have already successfully exploited the mind, body and spirit market. As I pointed out back in 2011, there are not too many $11 billion market opportunities around; so perhaps it is time for classical music to stop talking entertainment and start talking well-being. Also on Facebook and Twitter. No freebies involved in this post. Photos by Sorojini. Any other copyrighted material on these pages is included as "fair use" for critical analysis only, and will be removed at the request of copyright owner(s). I really think you're on to something here, and much appreciate your post. With all the new neuroscience showing how music and music making affect the brain, we can now take that as a given. It may be a while, but my intuition tells me this physical resonance will end up having empirical support as well. Sort of as a side note, I know there's a negative aspect to this, as very low bass notes can make me physically queasy (as can some of Wagner's harmonies). On the positive side, I've taken up the French horn late in life and part of daily practice is feeling the exhilaration of something inside me resonating with the glorious tone of that instrument - an experience way beyond anything I've felt with any other instrument - and something I have great difficulty putting into words.